A flawless, functional smile that looks as good as it feels is something we think every patient deserves. Following dental damage or tooth loss, the Dental Excellence Melbourne team offers a wide range of restorative dentistry services to recreate the beautiful smile you’ve lost. 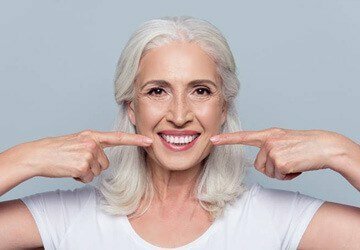 If you’re struggling with the loss of numerous teeth or a full row of teeth, you may think that traditional dentures are your only option. While these restorations are still the right choice for some patients, implant-retained dentures offer improved stability and longevity more closely mimicking natural tooth function. 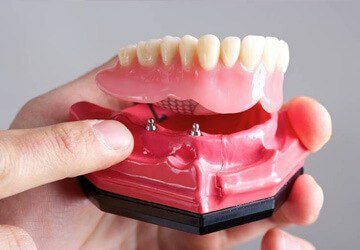 If you want to learn more about dental implant supported partial or full dentures, call to schedule a tooth replacement consultation in our state-of-the-art Melbourne dentistry office. Traditionally, tooth replacement options only restore the parts of teeth visible above the gum line, leaving your smile only half repaired. Dental implants are small, posts that are surgically positioned into the jawbone, mimicking the lost root structures of your teeth. This means your replacement teeth will look, feel, and function exactly like your natural smile. 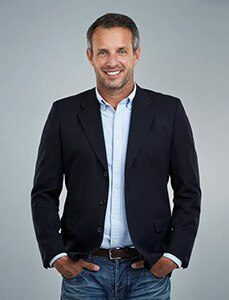 We can offer dental implants crafted from a variety of materials, but for best results, we usually recommend titanium or zirconia implant posts as these have been tested and proved effective. The number of dental implants we use depends on how many teeth are lost and where they are located within the smile line. We will usually recommend two to four implant posts to support a partial denture. Four to six strategically positioned implants are typically adequate to provide support for a full top or bottom denture. Once in position, your implant-retained denture can last for twenty years or longer. With proper care, many patients keep their implant dentures for the rest of their lives. This is compared to traditional removable dental prosthetics that need to be repaired or replaced every five to ten years for optimal function. How do I Care for My Implant-Retained Dentures? 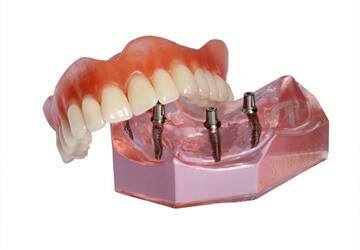 Implant-retained dentures can be either fixed or removable. If you have a removable denture, you can simply take out your denture before sleep to brush the prosthetic. Then, store your denture in water or cleaning solution overnight in the same way you would care for a traditional denture. If your implant denture is fixed, you can brush it just like healthy, natural dental structures. You may need to use special flossing tools like air or water flossers to remove plaque and tartar buildup between the denture base and the gums to avoid plaque buildup that can lead to periimplantitis, a form of gum disease that effects patients with dental implants. If you have any healthy natural teeth remaining you should continue to brush and floss at least two times each day as usual. You should also at least rinse out your mouth between means but taking the time to brush is ideal. During your six month dental exams and teeth cleanings, we will continually assess the fit and function of your implant denture to ensure your smile looks, feels and functions flawlessly for years to come.